While much of North America copes this week with a “polar vortex” of near-zero temperatures, we were reminded of the hard winter others face in different parts of the world. Natives of Shirak often refer to the area as the Armenian Siberia and consider themselves exiled from much of the country’s cultural and economic life, especially the prosperity many compatriots in Yerevan, the nation’s capital, have been enjoying in recent years. Indeed, the gap between the socioeconomic development in Yerevan and the lethargy of Armenia’s rural, impoverished north widens by the day. Whereas newly constructed supermarkets, boutiques and luxury high-rise buildings illuminate Yerevan’s streets, the only signs of modern life in Ashotzk are the occasional car and Tiramayr Narek Hospital. Ashotzk rises some 6,600 feet above sea level and is covered in three to five feet of snow six months out of the year. During the winter months, temperatures often drop to 40 degrees below zero and many of the roads are closed. One road, known as the “life road,” is kept accessible throughout the winter and is used only in the case of medical emergencies. It extends 17 miles from the village of Berdashen, the neighboring community closest to Armenia’s northern border, directly to the hospital. Before the hospital commissioned the construction of the “life road,” residents had no way of reaching medical care in the winter months. To this day, residents still try to plan their pregnancies so that mothers give birth between the months of April and October. “Getting to the medical center in Gyumri was impossible in winter before there was the hospital,” said Mariam Simonian, a nurse who lives in Berdashen. 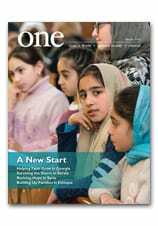 Read more about the Armenian Winter in the March 2009 issue of ONE.